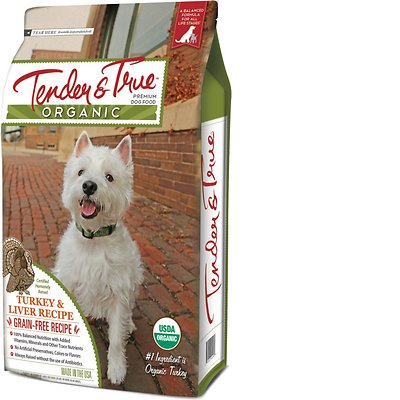 Tender & True Organic Turkey & Liver Recipe is a high-priced dog food with average quality. This product has 1 controversial ingredient but no artificial preservatives, colors or flavors. It has a high amount of carbs, compared to its protein and fat content, and the meat and fat quality in the food is mixed. On a better note, Tender & True has a below average number of recalls and was relatively transparent when answering our questions. Organic Turkey, Organic Chicken Meal, Organic Tapioca Starch, Organic Dried Peas, Organic Chickpea, Organic Flaxseed Meal, Organic Potato Starch, Organic Dried Liver, Organic Pea Flour, Organic Chicken Fat (Preserved With Mixed Tocopherols), Organic Chicken Liver, Organic Liver Digest Meal, Menhaden Oil (Preserved With Mixed Tocopherols), Choline Chloride, Natural Mixed Tocopherols, Monosodium Phosphate, Calcium Carbonate, Ascorbic Acid, Vitamin E Supplement, Zinc Proteinate, Zinc Sulfate, Manganous Oxide, Manganese Proteinate, Inositol, Ferrous Sulfate, Niacin, Vitamin B12 Supplement, Zinc Oxide, Iron Proteinate, Thiamine Mononitrate, Biotin, Riboflavin Supplement, Calcium Pantothenate, Pyridoxine Hydrochloride, Sodium Selenite, Copper sulfate, Vitamin A Supplement, Copper Proteinate, Citric Acid (Preservative), Vitamin D3 Supplement, Folic Acid, Potassium Iodide. The average dog food we reviewed has 39 total ingredients, with 1 controversial ingredient. This product has 1 controversial ingredient, which we will go over below. Organic turkey is generally a healthy dog food ingredient. Raw meat contains about 75% water which is cooked off during the making of dog food. This leaves only a fraction of the protein content in the final product's weight. We recommend looking for dog foods that also include meat meals in the first five ingredients (pre-cooked meat powder that contains four times the amount of protein). Organic dog food ingredients are free of antibiotics, synthetic hormones, pesticides, chemical fertilizers and artificial preservatives. They are also not allowed to be genetically modified. Organic chickpeas (also called garbanzo beans) are a legume that provides nutrients such as protein, fiber, folate, iron and phosphorus. They are generally a healthy dog food ingredient. Organic dog food ingredients are free of antibiotics, synthetic hormones, pesticides, chemical fertilizers and artificial preservatives. They are also not allowed to be genetically modified. Live digest is produced by chemically breaking down the organ into a liquid that can be used as an added flavoring. It makes it more likely your dog will like the food. However, this is a controversial ingredient because it's a heavily processed animal ingredient that may contain lower-quality ingredients. Additionally, the species it comes from is unknown here. This food is made in the USA. that’s good because high quality and food safety standards need to be followed. The meat and fat quality in this dog food is varied, let’s take a closer look. It includes Organic Turkey, Organic Chicken Meal, Organic Chicken Fat, Organic Chicken Liver, and Menhaden Oil. What makes these great is that the meat and fat sources here clearly show which animal they come from. At the same time, and surprisingly, the food then also includes Organic Dried Liver and Organic Liver Digest Meal. It’s good to know that these ingredients are organic, but they do not transparently show which animals they were made of. Tender & True Organic Turkey & Liver Recipe contains 0 controversial artificial preservatives. It’s good to know that ‍not all artificial preservatives are bad. That’s because they serve an important purpose, which is to prevent food from spoiling. However, we consider 11 artificial preservatives controversial because of their potential link to cancer and other serious health conditions. 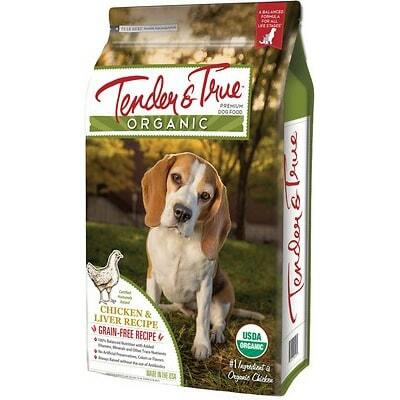 Tender & True has a below-average number of recalls. We do analytical analysis on all of our foods at the plant and again check samples at several independent laboratories. We conduct our animal studies at an independent animal facility for palatability, stool quality and digestibility. We also do urine pH on our cat foods. We also do some in home testing but not of a statistical basis. As well, we do comparative studies against some of the market leaders. All of our diets meet the 2018 AAFCO Nutritional Guidelines for both lines of dog and cat foods.